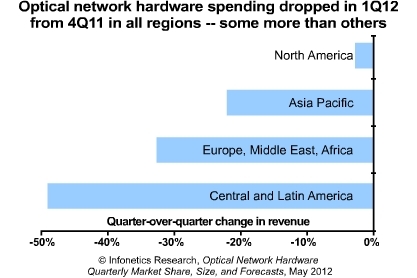 Market research firm Infonetics Research today reported in its Optical Network Hardware vendor market share report that spending on optical gear dropped 23% globally in the first quarter of 2012 (1Q12) from the previous quarter. This seems to contradict the recent WSJ article indicating there’s a new fiber optic buildout boom underway in the U.S.
Asia Pacific was buoyed by strong spending in Japan, with NEC and Fujitsu posting eye-popping 28% gains in 1Q12 from the year-ago first quarter 2011. Infonetics’ quarterly Optical Network Hardware report tracks Adtran, ADVA, Alcatel-Lucent, BTI, Ciena, Cisco, ECI, Ericsson, Fujitsu, Huawei, Infinera, NEC, Nokia Siemens Networks, Nortel, Sycamore, Tellabs, Transmode, Tyco, ZTE, and others. The report provides worldwide and regional vendor market share, market size, and analysis (forecasts are published May 25). Equipment tracked: metro and long haul SONET/SDH and WDM optical network equipment (transport, ROADM, submarine line terminating equipment), and ports (Ethernet, SONET/SDH/POS, and WDM). What’s Tracked in the report: EquipmentWDMMetroTransport, ROADMLong HaulTransport, ROADM, SLTESONET/SDH Optical Network Hardware: RevenueMetro, Long HaulP-OTS: Revenue1st Gen, 2nd Gen, etc.